(Blogger’s note: Every once in a while, I come across something so awesome that I must shout it from the blogosphere. If Oprah can have her favorite things, why can’t I? Oh, tiny cart. So petite, yet efficient. 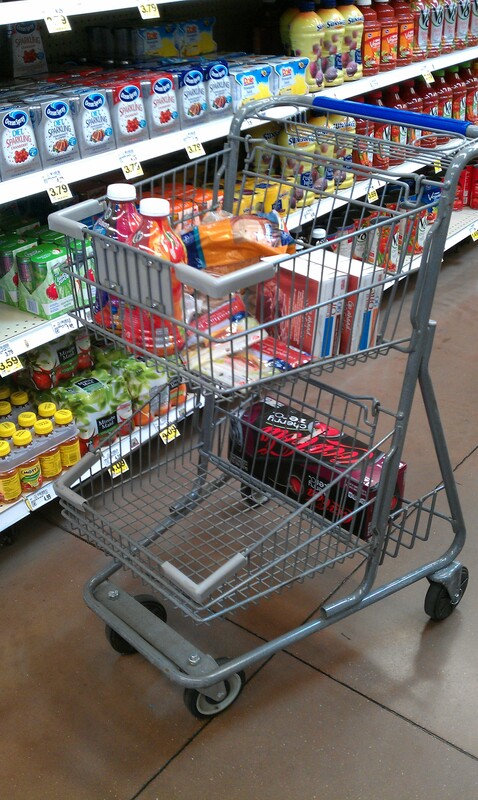 I fell in love with Kroger’s tiny carts when I started living on my own and grocery shopping for one. I ust had to play a game of Goldilocks and the Three Bears to figure that out. Kroger’s hand baskets are suitable until you decide that you HAVE to buy the 12-pack of Diet Coke. Then you end up with a Grand Canyon-sized dent in your arm. The regular-sized carts are hard to manuever, and lend themselves to some unneccessary purchases (why, yes, I WILL buy the three boxes of Raisin Bran Crunch that’s on sale — I have the room in my big girl cart!). The tiny carts, however, are the Mini Coopers of consumerism. These tiny wonders are the perfect size for singles buying food just for themselves. They hug the curves as you round the corners of the aisle. And they’re just so darn cute. These carts are usually stranded on the grassy knolls of parking lots or abandoned on the fringes near the streets. Cart collectors don’t make much of an effort to get these little guys back in the store because they don’t neatly fit into a row with their big brothers, the behemoths designed to haul both children and groceries. But if you’re single, or just need to pick up a few items, it’s worth a trip to the back of a parking lot to use one of these carts. I’m a lover of the mini-cart, too! It’s a great size for shopping for two, as well as just one. Plus it keeps me from buying all the things I “don’t need” to be eating. I love these carts! Meijer has them too.